This capacious black fridge only burns through 84 kilowatts per year, so it will be able to work efficiently without needlessly raising your electricity bill. 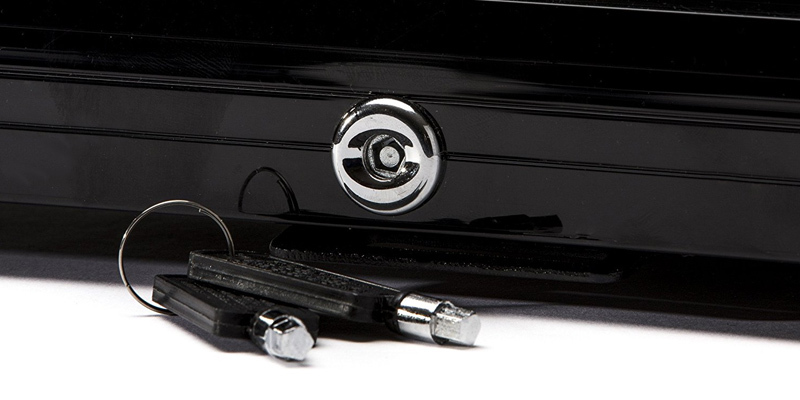 The model also comes with a lock and 2 keys that will keep the contents guarded and away from the young ones. The thermostat is mounted to the rear wall, which is rather inconvenient. The Subcold fridge is as quiet and compact as the more basic counterparts but its main advantage lays in just how capacious it is. With 49 litres of space, this is one of the best fridges for a homeowner that likes to throw parties. It's going to keep your guests refreshed with chilled beverages while the stylish design and lit-up interior, visible through the glass door, will surely attract their attention and become a welcome addition to your living room's decor. The cooling fan in this model is extra quiet, running below 38 dB. This makes the bar@drinkstuff cooler one of the few fridges that you could keep in your bedroom without disrupting your sleep. The interior light stays on when the door is closed so you'll have to occasionally change the light bulb. Plenty of mini fridges out there aren't exactly energy-efficient or environmentally friendly, but the Drinkstuff cooler does not belong on that list. The small appliance in question is quiet, childproof, and great for those that care about the environment. 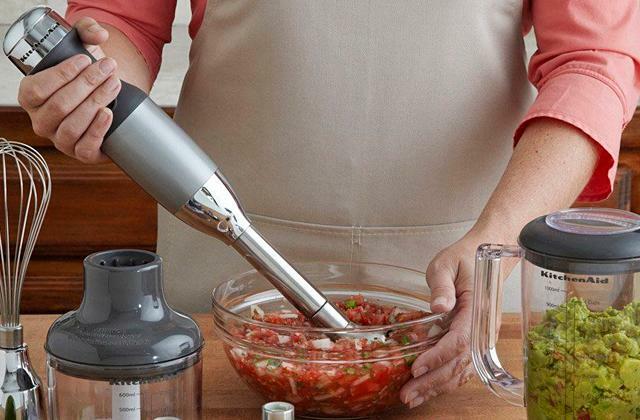 It won't take up too much space in your living room while cooling a whole lot of drinks at once. You can choose between the 2 power levels depending on your needs and requirements. 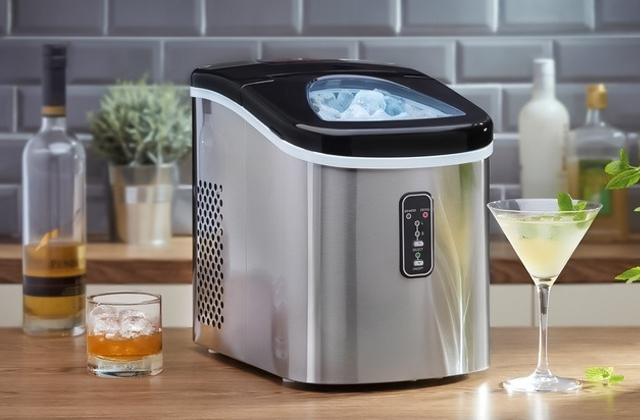 The Max mode is best for chilling produce while the ECO mode is recommended for keeping the beverages cool. Some customers have complained about this model being too noisy. If you enjoy camping and fishing trips, this is the fridge for you. 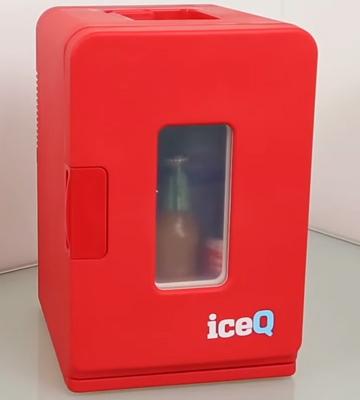 Easy to carry thanks to its modest size and a special handle, the IceQ cooler will add a touch of luxury to your weekends as you'll be able to take in the beauty of nature whilst still enjoying a cold can of beer straight out of the fridge. 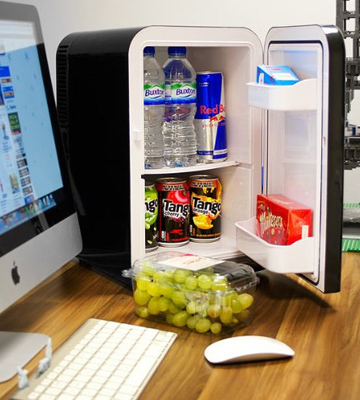 The Signature mini cooler fridge emits practically no heat while working, making it one of the few models that could be placed safely next to desktop computers and other appliances. The appliance doesn't have a door rack. As this fridge is pretty small, it might not be the best choice for a living room beer cooler. However, we find it to be the perfect car fridge as it won't take up too much space, can be powered by a lighter socket, and doesn't eat up too much energy. If you want to enjoy a cold can of soda on the road, this is the perfect cooler for you. 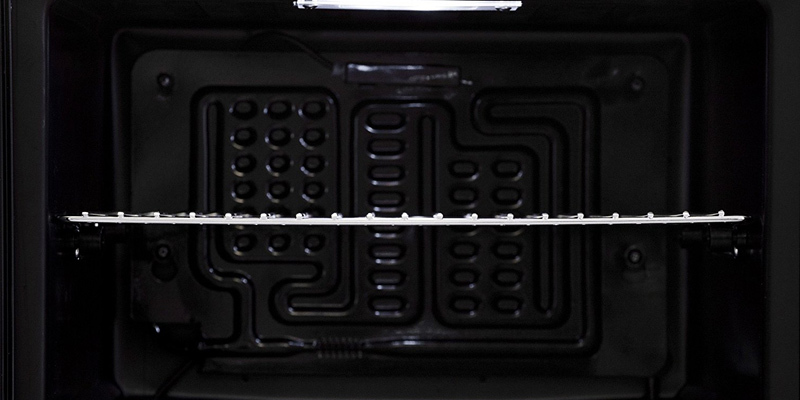 The power cables are long enough to position the fridge the way you see fit even when the socket is far away. The latter detail will allow you to use it conveniently for picnics or as a small cooler for a basement man-cave. The handle isn't too comfortable to use when the fridge is full. This personal Drinkstuff fridge is a bargain at this price, considering how powerful yet quiet it is. You can cool your drinks in the summer and, using the built-in heating mode, keep your food and coffee hot when it's chilly outside. The lack of a lock might be an issue for parents but using this model as an office refrigerator will prove to be practical and convenient. Want to stock up on your favourite drinks but don’t have that much space in your refrigerator? Well, you’ve come to the right page then, because the Subcold Super50 will prove to be a perfect solution to your problems. 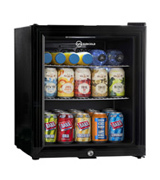 With a 49-litre capacity, you can store enough beer, soda, or other soft drinks to last for weeks or even more. Though we'd advise putting in a maximum of 45 bottles or cans to leave some space free. 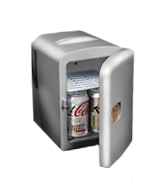 This makes it easier to take the containers out and lets the cold air flow freely, chilling the drinks and keeping them cool for you to enjoy. 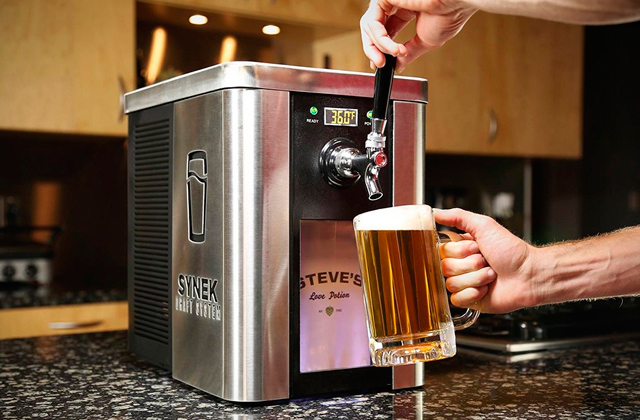 While this kind of appliance may seem like a luxury item, it’s actually pretty efficient since it cools beer and other beverages without costing too much in terms of maintenance. With an annual consumption of 84 kilowatt, the fridge will barely have an impact on your electricity bill. Is a couple of pounds per year too much for such a convenience? We’d say it isn’t, considering that it’s practically as powerful as a regular refrigerator and even has an ice maker to keep your drinks chilled when you take them out of the cooled compartment. 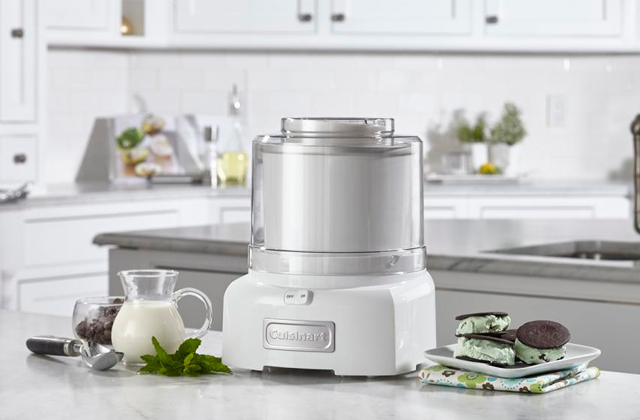 Many users undervalue the importance of a good ice maker but if you’ve ever had a get together at your house during the summer, then you already know how useful this little feature can be. We do wish it'd be built in the appliance but that clearly could only be done by sacrificing space in the fridge itself and it’s always better to have that space for an extra beverage. We’ve read a lot of concerns from parents saying that they’re afraid of kids getting into beer fridges and taking out the alcoholic beverages, so it's a good thing that you'll never have to worry about that with the Subcold Super50. This model comes with a lock and 2 keys that will keep the contents guarded and away from the young ones. For further convenience, the model has a pretty silent compressor, which emits just 42 dB of noise. You’ll barely register its hum over the sound of a quiet conversation, even when standing right next to it. Also, the double-glazed glass door on this mini fridge is not just extra sturdy but reversible as well. This makes it much easier to find a proper spot for the fridge as you don’t have to worry about the door hitting other appliances. If it’s in the way, just reverse its direction and you’re good to go. While the Subcold Super50 Mini Fridge is one of the best beer fridges on the market, it does have some flaws. For example, you might not be too thrilled with the thermostat being placed in the rear. If you want to change the temperature, you’ll have to move the refrigerator so you can see the controls. Of course, having a 1-18°C cooling range is pretty amazing but we still wish the thermostat was a bit easier to get to. With that said, the aforementioned flaw is no dealbreaker and the Subcold Super50 is still one of the most capacious beer fridges out there. You can fill it with your favourite beverages and, if you need some extra space, the 2 sturdy chrome wire shelves can be slid out to make room for another can or two. 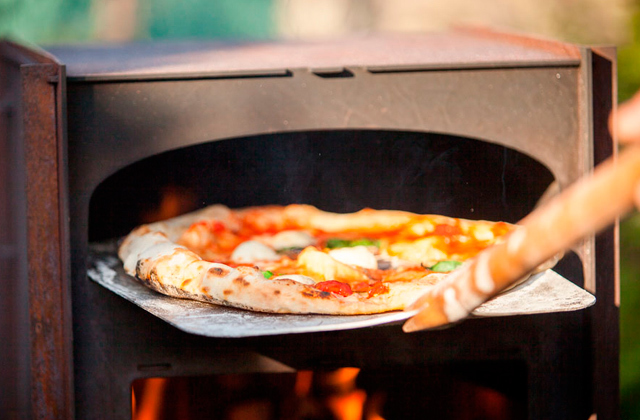 It’s the perfect choice for large families or anybody that likes to throw parties in the summer. Not everybody has the space for a huge refrigerator but the convenience of having chilled drinks or snacks in your living room or an office is quite tempting. Which is why plenty of people opt for a compact model like bar@drinkstuff ChillQuiet, which is as powerful as bigger appliances but won’t take up that valuable free space. 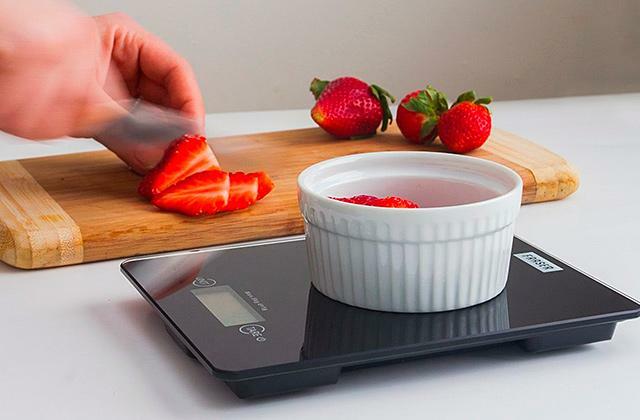 It is also a great countertop model thanks to its compact size of 46.6 x 43 x 40 cm. While 17 litres of storage might not seem like much, the fridge can hold up to 20 cans of beer, soda, or any beverages you prefer. Of course, it’s also good for snacks that you want to keep from going stale. The Drinkstuff ChillQuiet isn’t intended for storing perishables for too long but leaving your sandwich there until lunch is certainly a viable option. The temperature range of 5-18°C is also quite impressive for such a small unit. This is possible thanks to the technology that adjusts the fridge's inner temperature according to the room one. That way, less energy is spent and the drinks and snacks stay cool without freezing. Of course, if you want a higher or lower temperature, the thermostat is fully manually adjustable. However, we’d recommend letting the fridge itself pick the optimal level as it will use less energy that way. If you have a party coming up and want more space to store drinks, the single shelf in the DrinkStuff ChillQuiet slides out easily, giving you more room to work with. 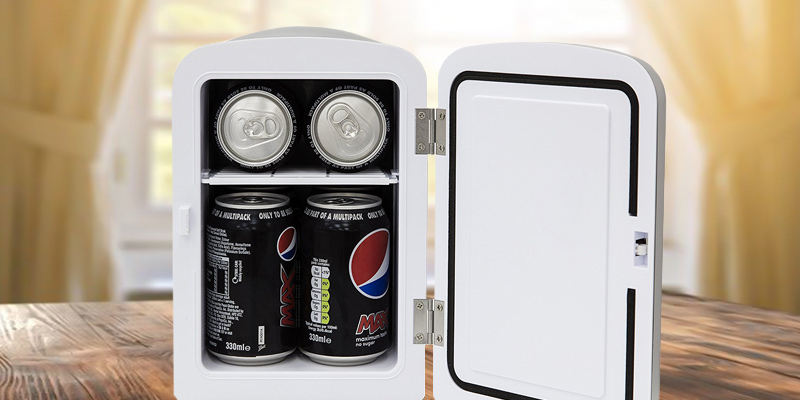 Plus, the door has a separate storage compartment which can hold smaller cans, snacks, or cartons. It is a bit too small for regular cans or bottles though, so fit those into the main one. Plus, you won't have to worry about the fridge sliding if you bump into it as the rubber feet will keep it planted firmly. And, speaking of safety, the door is lockable, so you can keep your kids away from the drinks or, if your son/daughter has a sweet tooth, the candy bars. We have also noted that the Drinkstuff refrigerator eats up around 35 kilowatts per year, which is a relatively small number. This is due to the special technology that reduces carbon emissions and cuts down on energy use by only working to sustain the temperature and not to constantly keep the chill up. The chill is kept up by the cooling fan, designed specifically to be as quiet as possible. With a sound level of just 38 dB, this is one of the least noisy fridges available, which is especially important if you’re going to place it in your office. An appliance this quiet won’t disrupt your work at all and you’ll barely even notice the sound it makes. All of that makes the Drinkstuff Mini Beer Fridge great if you want to save money on the electricity bill while also helping the environment. Not to mention the fact that you can tuck it in the corner or place it right by your couch so you’ll always have a chilled beverage ready while enjoying TV or relaxing with your friends. Nothing feels quite as great as a celebration over a hard-fought victory in an online shooter with a cold can of beer or soda but running off to the kitchen after a match isn’t very practical. Which is why we recommend getting the IceQ ICEQ15RW Litre Deluxe Portable to perfect your man-cave and make it your perfect little haven. With this tiny fridge, you can always crack a cold one without having to get up and walk around the house. 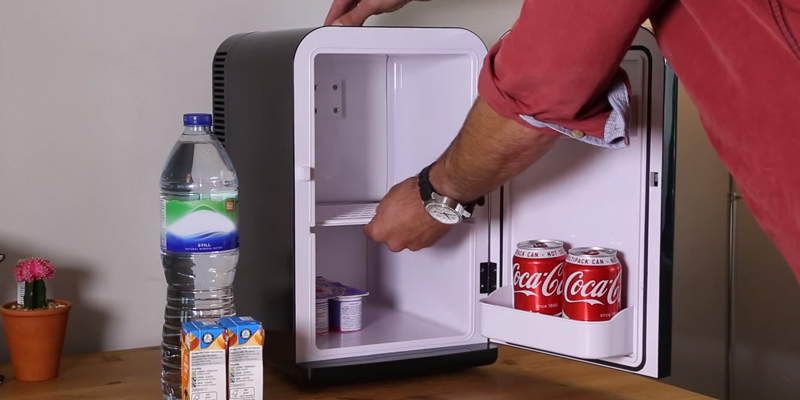 The IceQ Mini Fridge isn’t just a flashy name either as the appliance is just 30.5 x 27 x 41 cm in size. You could put it on your table next to a sizeable gaming rig and still have some space left over to put speakers for the surround sound effect. In fact, you could even place it in your office, if the workplace allows it, enjoying a fresh snack or chilled Coke during your lunch break without having to go to the store or a subpar office cafeteria. And don’t worry about the fridge humming too loudly and annoying you during the game or disrupting your work, the cooling fan on this model is designed to be as quiet as possible. Sadly, no technical specifications are available on this but most customers claim that the sound is comparable to a desktop computer. 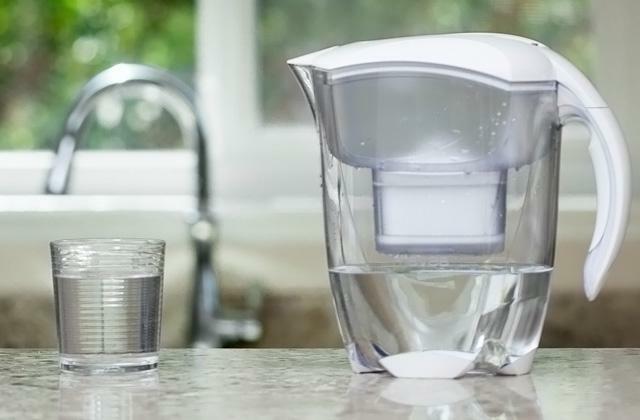 Plus, iceQ appliances use the Peltier technology, which makes them more environmentally friendly on top of the lowered noise, so you can enjoy chilled beverages while keeping our planet clean! 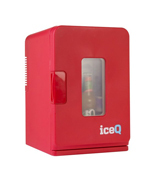 The advantages of iceQ don’t stop there, though, as the tiny fridge is also great for picnics or camping trips, as long as you have something to power it, be it a portable generator or your own car. The appliance comes with both a mains plug and a 12 V car lighter socket so you can keep it running using the engine in your vehicle. But that’s not all that makes the IceQ ICEQ15RW such a good choice for outdoor trips. This model weighs just 3.9 kg when empty, quite lightweight compared to its counterparts. And the carry-on handle lets you hold it comfortably without having to support it with both hands or risk dropping it. 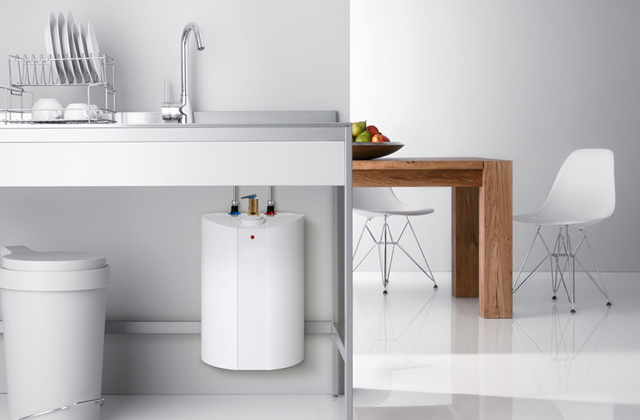 Despite being so compact, the fridge can hold up to fifteen 0.33 l cans, more than enough for a working week or a little get-together with friends. Alternatively, you can take out the removable shelf and put in some bigger containers, up to 1.5 litres. Of course, you ought to fill it with whatever you enjoy. Plus, you can check up on your stock through the frosted perspex glass door, which is damage-resistant and insulated to keep the cold in. Speaking of temperature and insulation, we’re glad that a heating mode was included but it’s not that powerful and eats up a lot of energy, straining the appliance and emitting much more noise than usual. With that in mind, it’s best to stick to refrigeration with this one. To sum up all of the above, we’d definitely advise buying the IceQ ICEQ15RW if you want chilled beverages but don’t have the space for a bigger model or enjoy camping trips with a touch of luxury. It’s eco-friendly, efficient, and can be taken anywhere. The iceQ fridge is affordable and the feeling of a cold beer on a hot summer day is absolutely priceless. 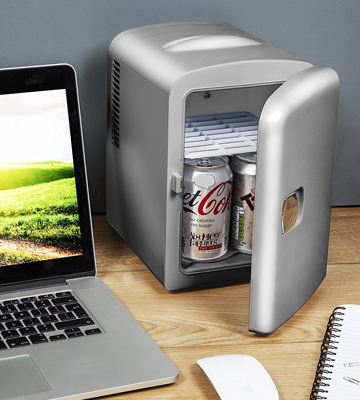 Let’s be honest, having a silent mini fridge next to your couch or a laptop would be great, if only for a quick access to refreshing sodas and beer. But finding space for a 5-kilo appliance that’s larger than a personal computer isn’t that easy, especially if you live in a flat. We’re not about to let you go thirsty, though, so why don't you check out the Signature S30007 while you're at it? For starters, it’s one of the most miniature refrigerators we’ve ever seen at 23.5 x 18 x 27 cm, easy to fit even in a cramped room. Plus, the Signature fridge weighs just 2.32 kilograms and you could even put it on a wall-mounted shelf or a coffee table without having to worry about damaging the furniture. Even though it’s tiny, the refrigerator fits up to 6 cans of soda or 4 of those larger beer cans. Naturally, it’s not that much for a big family or a homeowner that likes to throw parties, but more than enough for a single person. 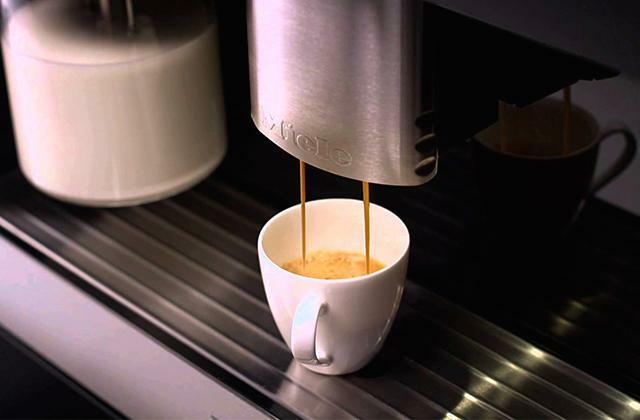 You can even take out the metal shelf to make some more space and maybe fit in another beverage. The temperature inside tends to fluctuate a bit in the range of 6-7°C but it never goes above that, so all beverages will be chilled properly. And if you want to put in some fruit or sandwiches to keep them fresh, this is the perfect temperature for storage as it’s not freezing but cold enough to preserve the food. Of course, we wouldn’t be recommending the Signature S30007 if it could only chill a few drinks with no special features available. For example, one thing you may appreciate is the heating mode. It’s a pretty handy addition if you need to store a hot lunch in your office while you’re working or keep a cup of tea warm while you pop out to the shop. 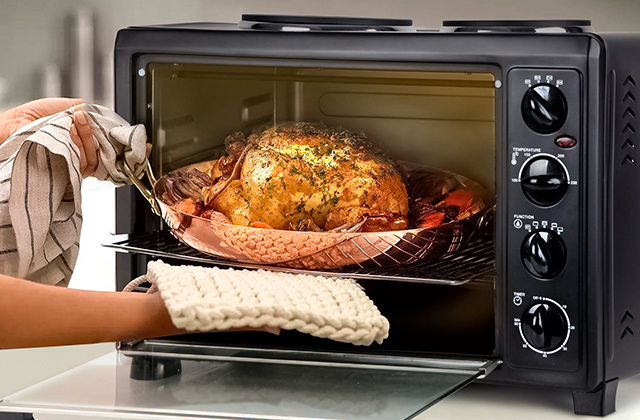 By all accounts, it seems to work well, though some heat will be able to escape anyway, so you won't be able to just leave some hot food in there for a day and expect it to remain warm. 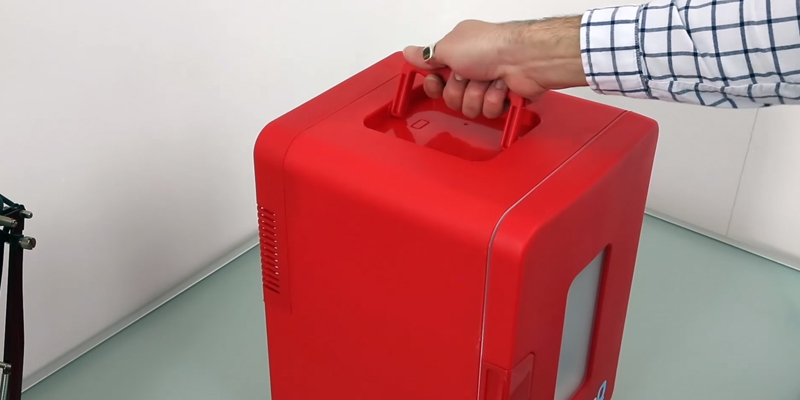 What’s best about this little fridge is just how portable it is. You can use the carry handle to transport the cooler from room to room or bring it over to work, using it like a more capacious thermos. It’s so lightweight that you won’t be encumbered by it and you can power it via the lighter socket while you’re driving. In fact, you could even keep the Signature refrigerator in your car permanently as a small drink cooler for road trips or your morning commute to work. The fridge fits between the seats and, due to its modest size, doesn’t eat up too much energy, making it great for this sort of application. With that said, we’d rather let you make your own choice. Would you rather have a huge appliance that runs louder than a herd of sheep and occupies half of the room but can be filled with enough beer for a year? 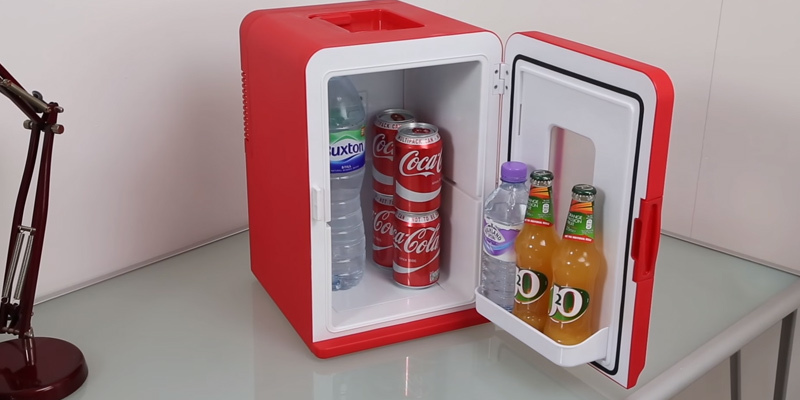 Or do you want a basic well-made fridge that stores a few drinks and doesn’t take up too much space, all while running relatively quietly? 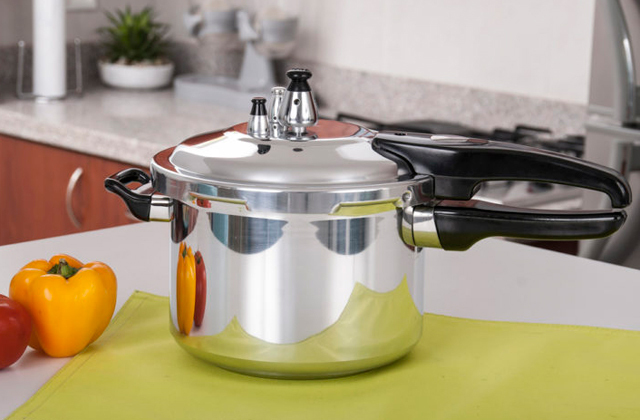 If size and convenience of use are your priorities, the Signature S30007 is a pretty smart choice, thanks in part to how easy it is to transport. Tired of your office lunches consisting of tepid soda and soggy sandwiches that don’t feel fresh at all? 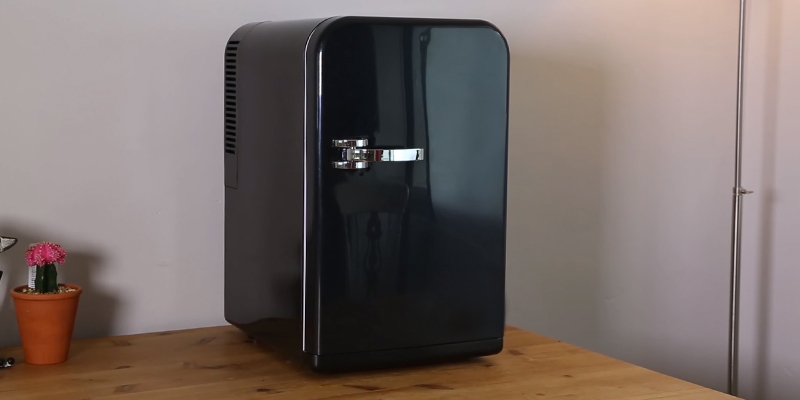 Then you should stop settling for mediocrity and try out the bar@Drinkstuff DS35575, a compact and light beer cooler fridge that can do so much more than you might think. 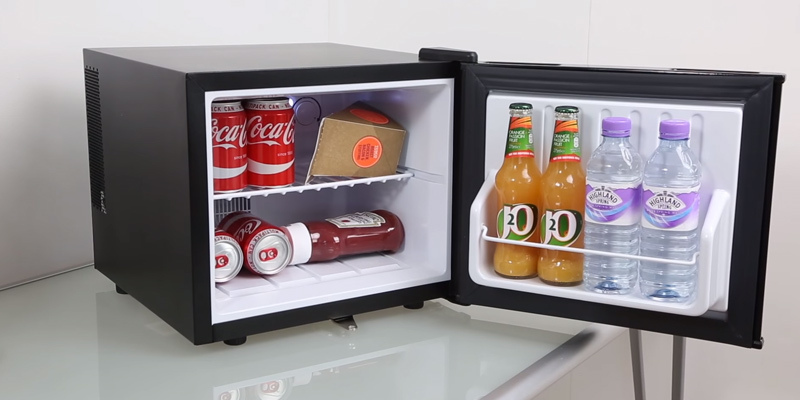 Of course, the primary function of this medium-sized refrigerator is to keep beverages and snacks chilled, regardless of what your preference in drinks or food is. The Drinkstuff cooler can chill its contents from 16°C below room temperature to a minimum of 5°C depending on wherever you decide to place it and whatever you fill it with. You can put up to 16 cans of Coke inside so you’ll always have something to quench your thirst with during the workday. Alternatively, place the fridge in your living room and keep beers on hand to enjoy during the football games. Now, a cold drink is good when it’s hot outside, but what about the chilly days when all you want is a hot bowl of soup or a warm bagel to nosh on? We’ve seen some fridges with warm modes but few have managed to impress us. The Drinkstuff DS35575, however, succeeded in this, being able to keep food and drinks hot for a few hours with a maximum temperature of 65°C! Sure, the warm mode isn’t the main focus of a refrigerator, but we’re all about practicality and the ability to ditch the leaky old thermos in favour of a sealed fridge is a welcome alternative. With this model, you’ll never have to return to a cold cup of coffee on your work desk after an urgent meeting, just pop it into the warm cabinet and it will stay hot, waiting for you to get back. Now, some people may feel inclined to ask “but what about the noise? I can’t have a humming appliance under my desk at work!” and let us assure these individuals that they’ll barely be able to tell it’s there. With a noise level of 43 dB, the bar@Drinkstuff DS35575 is no louder than your desktop computer or the bustle of the city outside your window. 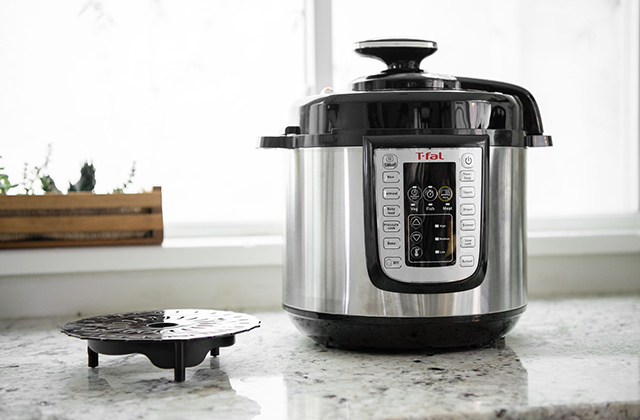 Another point of contention with many of these luxury appliances is how much energy they tend to eat up and whether the added convenience is worth it. However, we can safely say that the A++ energy efficiency rating makes the bar@Drinkstuff DS35575 a very viable purchase. The fridge consumes less than 33 kilowatts per year, so even if you run it every day, it won’t be able to make much of an impact on your electricity bill. Having said all of that, there are no perfect products, and the Drinkstuff fridge does have a shortcoming. We are a bit disappointed that the fridge has no lock as it’s a necessity for any parent. Curious kids and unlocked refrigerators full of beer don’t mix too well and putting on even a simple keypad with a password would make this model much safer to keep around the house. Overall, while the bar@Drinkstuff DS35575 has its flaws and isn’t as capacious as some of the high-end models, it’s a very solid choice for an office fridge and the heating mode, though not a usual staple of refrigerators, has really won us over due to how effective it is and how important a hot lunch can be on a miserable winter workday. What Is a Beer Fridge? While it may seem that the refrigerators are getting bigger and bigger these days, so are our grocery lists, to be completely fair. Surely you wouldn’t want to replace salad or any other useful and essential produce, piece of meat, or some kind of ingredient for something as arguably unimportant as a couple of cans of beer, but wouldn’t it be nice to always have enough space for your favorite brewski to enjoy at the end of a long day? Or, better yet, have an access to a cold can of beer inside your own car? Well, all of that is possible with a simple beer fridge. As the name suggests, we are talking about a household and sometimes portable appliance that will allow you to store from a single can up to dozens of your favourite beers for you to enjoy after a long day at work in the comforts of your own home or on a picnic at a nice little family getaway. Heck, you can even place one of these in your office to make sure that those tiresome Fridays get a proper evening celebration. And if beer isn’t necessarily what gets you out of bed in the morning and you consider yourself more of a wine guy, you might want to consider purchasing a wine aerator. 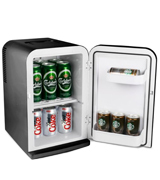 As you would imagine, a beer fridge is not necessarily one of the more complex appliances out there, so there aren’t a whole lot of things you have to keep in mind if and when you decide to purchase one. Nevertheless, there are still a couple of aspects that we would definitely recommend taking into consideration before settling for a product that suits your needs and preferences, with the first one of them being the capacity of the fridge. Some of these models will be able to provide enough space for literally a hundred cans while others are designed to fit no more than a single brewski, which is why it is important to take into account what it is exactly you’re looking for out of your beer fridge. If you want one to put in your own home and you have enough space in your house or your apartment, you could easily opt for the most capacious offer out there. On the other hand, if you’re looking for a model that will prove to be useful in a variety of scenarios, be it a family getaway somewhere nice and sunny or a little corner in your office to store a few drinks, you might want to choose a more versatile product that features somewhere around 0.35 cubic feet in volume and is able to fit from 6 to 12 cans of beer. 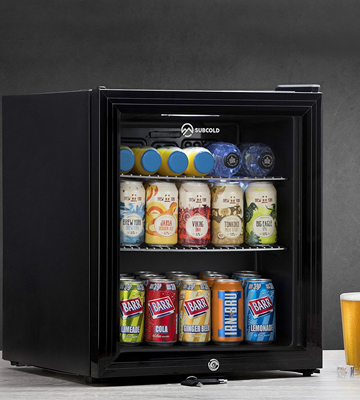 Finally, if all you want is to always have one cold brewski to enjoy whenever and wherever you want, you may always go with those incredibly compact fridges that are designed for no more than a single can. Now, it should probably go without saying, but the capacity of the fridge is largely determined by the size of it, so you should definitely take its dimensions into account and consider just how much free space you have in the place where you’d like to put the fridge. Aside from that, once you have figured out where exactly you’d like to put your beer fridge, do not forget to look into the source of power the model utilizes before you actually purchase one. If you aren’t just looking for an appliance to put inside your house and never actually move it, you might want to make sure that the model can extract power from a car cigarette lighter port or a USB port. Finally, there are also all kinds of extra conveniences that will be able to help you make the right choice and the number of shelves that you should keep in mind if you’re going for a spacious beer fridge that can store a dozen or more cans of your favourite cold beverage. If we (or anybody else, for that matter) were to take a wild guess without actually looking into the roots of this question, it would have to be a regular refrigerator that came first and a beer fridge that followed him. Nevertheless, that isn’t actually the case. It was the middle of the 19th century when a Scottish-born journalist living in Australia that went by the name James Harrison came up with the idea and invented what is now known to be the very first properly functioning refrigerator using no other compound but ether. According to this enterprising individual, he used this groundbreaking invention strictly to cool his beer. The man did not even care to file a patent for his invention, which is why a decade later a French monk would receive all of the credit for the very first domestic refrigerator. By the way, the monk’s name was Abbé Marcel Audiffren and the guy used this appliance with the sole purpose of cooling wine, not entirely dissimilar to the Scottish-Australian’s application, as you would imagine. A few years after the fact, the man decided to sell the rights to his creation to General Electric, which later started to sell them charging people about a thousand bucks for a single model, twice the price of an average car at the time. Now, if you feel like fridges have been exponentially growing in size for the past couple of decades, we would just like to mention that, slightly dissimilar to our current models, a fridge could weigh up to 5 tons in the latter part of the 19th century. Suffice it to say, these things were a bit too big to install at home. Barely useful appliance accessories that come with all kinds of smart home devices are all the rage these days. And while that is true that you can hardly surprise anyone with a fridge that comes with a built-in television or a Wi-Fi connection, this kind of approach is actually nothing new to the fridge tech industry. In 1937, for instance, one company, trying to stand out from the ever-increasing crowd of competitors, came up with the idea of a refrigerator with a radio built into it. And, oddly or not so oddly enough, they have even been able to sell a few of these models before the line was permanently discontinued. So next time you walk by a fridge that features such “useful” novelties as the ability to show off a family photo or a calendar on a digital display, these are the people you ought to thank for that. Q: Can I store perishables in my mini fridge? Which temperature would you recommend for keeping milk fresh for a week or so? A: We strongly advise against keeping your milk in mini models. 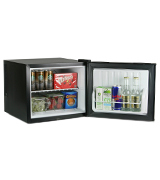 These are intended to keep things mildly cold, chilling beverages and snacks. Perishables, including milk, could survive a day or two but more than that is a big gamble. It’s best to keep those products in a regular fridge, unless you have absolutely no free space left. Q: How can I tell if the shelf in my model is removable? Can I just try pulling it out? A: Most appliances will have that information specified on the product page or in the manual. And, of course, we try to provide that info if it’s available. Moreover, most models have removable shelves as it’s more convenient for the customer. If you’re not sure, try gently tugging on the shelf to check whether it slides out. Just don’t pull too hard in case it’s non-removable. Q: My 15-litre fridge only has space for 14 cans, why is this? Am I placing them wrong or is it a faulty model? A: This is pretty standard as far as fridges go as the internal space is taken up not just by products but by shelves and racks as well. If you take out the removable shelf, you’ll get just a bit more space but that can make a difference and let you store another can of beer, provided that you place it correctly. Also, remember that the dimensions of a can or a bottle aren’t uniform and different brands have different container sizes. So your fridge might actually be able to store 15 cans of some other drink. Q: How can I get rid of the noise the fridge makes? Is it possible to cover it to make the hum quieter? Or maybe I can make the temperature higher to minimise the strain on the cooling fan? A: First off, do not cover the fridge with anything, especially the back panel. This would be a massive fire hazard and could cause serious damage to the appliance. 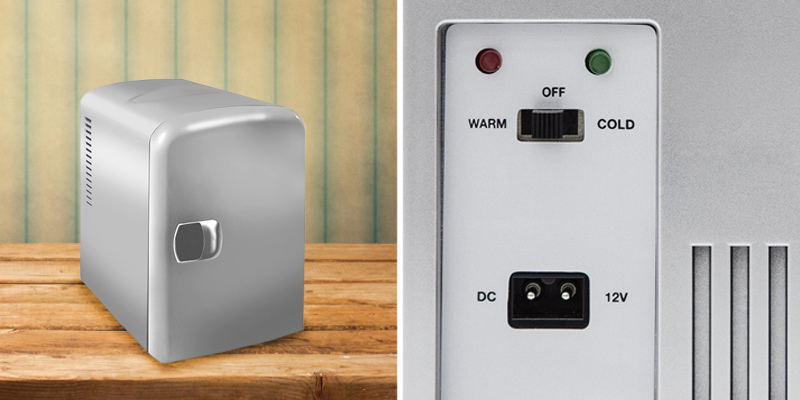 Changing the temperature doesn’t affect the noise much unless the appliance is a low-quality one. Most high-end models emit a stable low hum that doesn’t get louder even if the fridge is running to keep the lowest temperature possible. Some of the mini fridges do have an eco mode that not only cuts down on noise but also optimises the cooling process to be more environmentally friendly. However, customers report that this mode is less effective in chilling beverages and won’t be an option on hotter days. A universal solution, though not the best one, is to simply place the fridge further away so the noise doesn’t reach you. That’s one of the primary reasons why most users don’t place these models in their bedrooms if they’re light sleepers. Q: Can I put my mini fridge right next to my PC tower or some other tech? A: Depending on the model, some mini coolers might have external parts on the back or the sides. If the insulation of the fridge isn’t up to par, the heat from constant operation may accumulate in these parts and, if they touch your rig, damage the computer. We recommend running the fridge for a bit and then checking to see if it gets hot just to be sure. Q: What is the best temperature for a beer fridge to run at? A: While there is no "golden standard", it's recommended to keep it at least below 4°C to ensure that the contents are chilled properly. 1. Shaunacy Ferro 15 Icy Cool Facts About Refrigeration, MentalFloss. February 25, 2016. 2. Frank Gruber Does Your Work Need An Office Beer Fridge? TechCO. August 6, 2017. 3. Paul Kita 3 Reasons Why Every Home Cook Should Own a Beer Fridge, MensHealth. November 29, 2017. 4. Chris Mooney Why it’s not okay to have a second refrigerator, The WashingtonPost. November 26, 2014. 5. Scott Desimon Two Fridges Are Better Than One: A Personal Journey, Bon Appetit. June 21, 2017. 6. 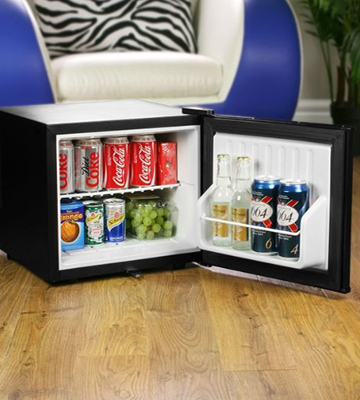 Wine cooler or beer fridge – which mini fridge is right for you? TechTalk. June 22, 2017. 7. Justin Kennedy The Best Place to Store Dark Beers? Not The Fridge., FOOD52. April 28, 2017. 8. Lee Breslouer THE 5 RULES FOR KEEPING YOUR BEER FRESH & DRINKABLE, THRILLIST. October 7, 2015.